"Town Meeting voted in early 1898 to build a new brick schoolhouse in Wakefield's North Ward to help ease crowded conditions in the elementary schools. The North Ward included the territory between Main and Salem Street, west of the Newburyport Branch of the B&M Railroad. 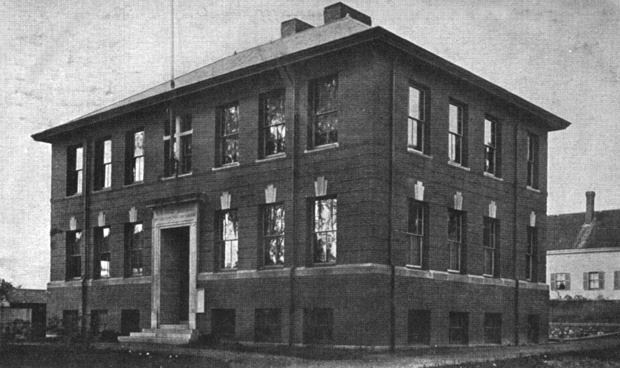 It was the third school to open in as many years, the others being the Warren School and the Greenwood School, both opened in 1897. Other elementary schools included the West Ward School (1847), Hamilton School (1883), and the Lincoln School (1892). After a report was presented by a committee, the meeting voted to build the new school on a 13,000 foot lot at the intersection of Cordis Street and a private way which ran north of Cordis and became a continuation of Pleasant Street. The location was 'favorably situated as to light, air, and drainage.' Arguments were made that the existing school building could be repaired at a cost of $1,000 and would be used for the next 25 years. It was also noted that many of the ward's 96 scholars were attending classes at the Lincoln School due to the cramped conditions at the North Ward School. Rather than vote for a two-room, one-story school, the meeting voted to build a four-room, two-story building, the second floor being unfinished. The building would be of dark red waterstruck brick with trimming of buff sandstone. The roof was covered with slate, with gutters, conductors, and ridges made of copper, and steps and basement windows made of granite. The inside finish was of North Carolina hard pine, with floors of Georgia hard pine. The first and second floors were to be the same, with a vestibule, corridor, coat rooms and a lavatory, teachers room, and two classrooms, each measuring 28 feet x 32 feet. The cost to build the school was $12,000. Debate continued over several meetings to name the school the Francis P. Hurd School in memory of Dr. Hurd, a 'cultivated, refined, and philanthropic citizen.' Upon his death he had bequeathed $2,500 to the Beebe Library. A subsequent meeting voted to spend an additional $25 to cut the name in a proper place on the building." -- Text from calendar by Jayne M. D'Onofrio. “F.P. Hurd School, circa 1900,” NOBLE Digital Heritage, accessed April 22, 2019, https://digitalheritage.noblenet.org/noble/items/show/6936.